Oh hi. How’s it going? Here’s a little update on me, for those who don’t already know. The last day of July was also the last day of my former career. You know, the one that I’ve been trying to change for the past 9 years. Since then, I finished my summer anatomy and physiology class (a year’s worth in 12 weeks), finished an online statistics course, pushed through some serious anxiety to attempt some networking, got my NASM personal training certification, started a food science class, started new workouts, achieved my goal of 205lb deadlifts, and got the personal training process started. It has been a complete lifestyle overhaul, which has simultaneously been both terrifying and wonderful. One of the perks is that I’m often home to experiment with lunch ideas. I’ve never understood the people who say, “Oh, I’ll just have a salad for lunch,” meaning one of those lettuce-tomato-cucumber-and-nothing-else salads. How do they not spend all afternoon with their stomachs growling? To me it’s like eating air. So anyway, when I think about lunch, my mind immediately goes to some kind of sandwich or wrap. I have no problem consuming enough carbs from other sources, so I try to avoid bread when I feel like it’s not worth it. My lunch solution lately has been to convert my sandwich idea to a salad. A delicious, hearty, satisfying salad, with protein and healthy fat! Ooh, exciting! 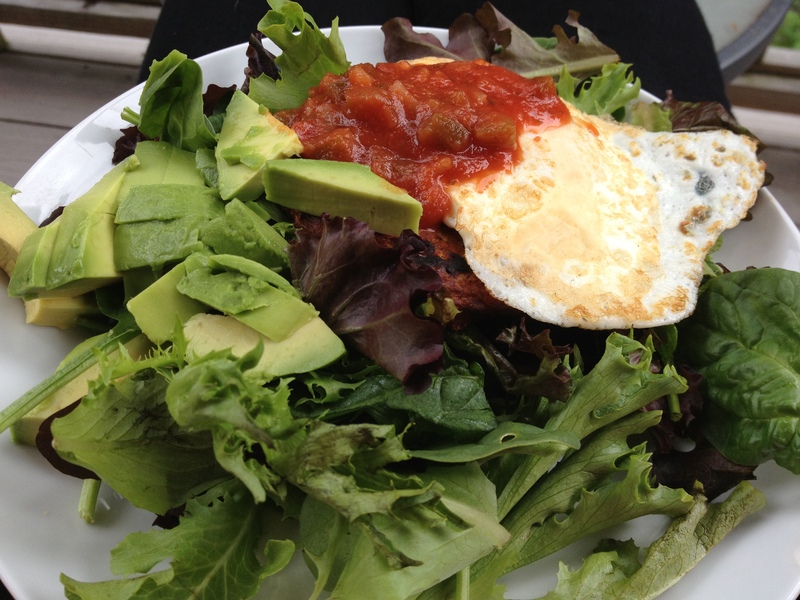 Salad #1: Morningstar black bean veggie burger, salsa, 1/4 avocado, fried egg, and salad greens. Black bean veggie burger, egg, avocado, salsa, and greens. Salad #2: Buffalo Chik’n Salad. I cooked a Quorn Naked Cutlet in Frank’s RedHot Original sauce, then sliced it and added it to a bed of baby spinach with crumbled feta cheese and avocado. I will use blue cheese next time. It also would be good over massaged kale instead of spinach. 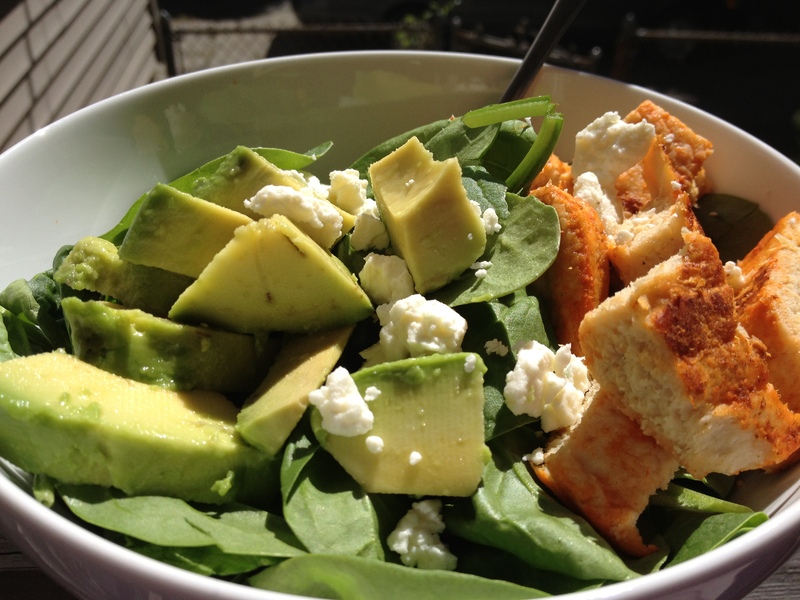 Quorn cutlet, Frank’s RedHot, avocado, feta, and baby spinach. Salad #3: Fall Celebration Salad! We picked 32 pounds of apples. We obviously had to have brie on hand to go with our apples and freshly made apple butter. This combination obviously needed to go into a salad. So, I sauteed a serving of Gardein mandarin orange crispy chik’n (but without the orange sauce), and then added about 1 tbsp of apple butter to it. This went over a bed of baby arugula, chopped apple, brie, and hazelnuts. Not the healthiest choice, but sooooo good! 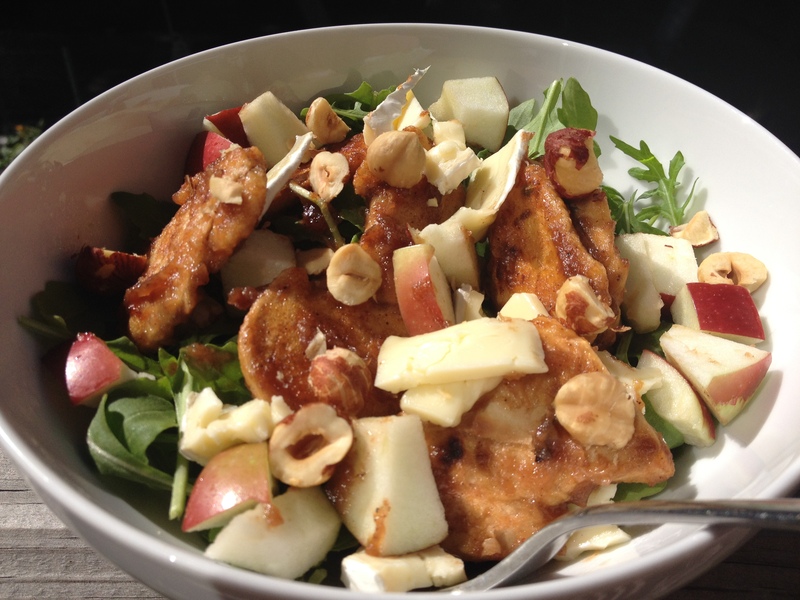 Apple butter chik’n, brie, apple, hazelnuts, and baby arugula. So, the lesson learned today is that salads do not have to be boring and unsatisfying. Meal Planning: Yes You Can! We were having dinner with friends a few months ago, including another 30-something-year-old couple. At some point in the conversation, I said something along the lines of, “Oh yeah, when I plan our dinners for the week…” They looked at me like I had three heads. The looks of confusion on their faces led me to believe that maybe not everyone does this? Is that true? Well, in the event that others out there are just as befuddled as our friends were, I thought that I would share our meal planning process. But why? Well, chances are that you will save money, be healthier, and still be able to eat delicious food if you put in a little time and effort. Your health and your bank account are worth it. Really. For me, it started in 2004, when we were broke. I had just graduated college, and I moved in with my boyfriend (now husband) into a ridiculously low-ceilinged attic apartment in Burlington, VT. It’s good that we aren’t very tall. Anyway, our post-college jobs were less-than-awesome, and we were on a very tight budget, especially with student loan payments starting a few months later. We simply couldn’t afford to buy groceries that were going to go unused and end up rotting in the fridge. So, once a week (usually on Sunday), we put together a meal plan with budget as the main priority, made a grocery list, and went grocery shopping. The priorities have evolved over the years. 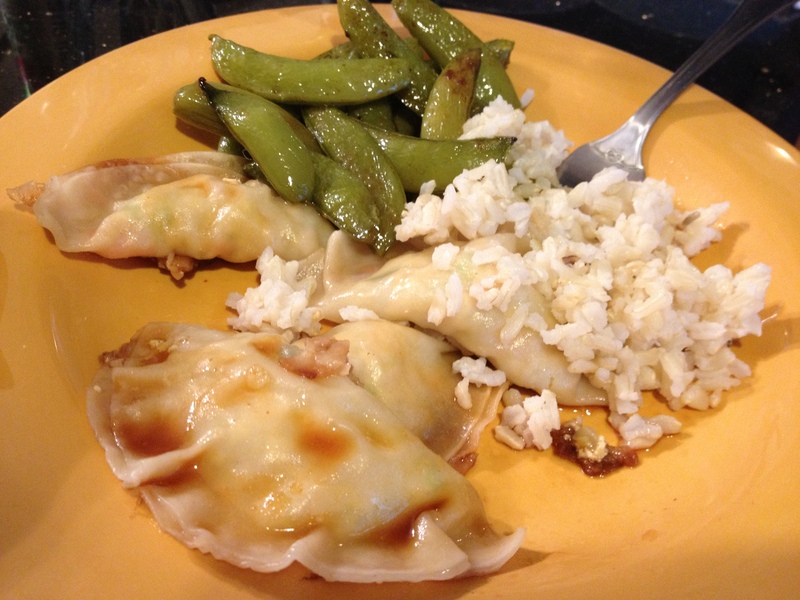 When I did Weight Watchers, I started planning WW-friendly meals. When I started lifting weights, I planned meals around macronutrient goals. When I was in class 3 nights a week, I tried to plan quick and easy meals. 1. Decide what your priorities are. This will give you a framework for planning. Budget? Dietary requirements? Time? Schedule? 2. Choose a starting point for recipe-finding. Skim sale flyers to choose foods that will be on sale. Try a new ingredient. Curious about pomegranate? Never had quinoa? Go for it! Choose a cuisine ethnicity. Maybe you have a favorite Thai dish that you would like to replicate, or maybe you’re really in the mood for comforting flavors of Italian food. Pick a protein. As vegetarians, our main proteins are eggs, tofu, legumes, tempeh, and seitan. If you are an omnivore, you obviously have many more choices. I don’t like to repeat proteins in a given week. It’s mostly because I get bored easily, but it’s also to maintain a balanced diet. For example, we might have one meal with tofu, one meal with eggs, and a meal with legumes. If you’re part of a CSA, prioritize your fresh produce and base your meals around it. You may have noticed that there are only three meals planned for a whole week. This is because we typically choose dishes with enough servings to last two nights so that we don’t have to cook every night. We do a quick check-in about our schedules for the week to determine how many nights we will be cooking, since at least one of us usually has something going on that takes us away from home for dinner. 3. Choose your meals. Some people don’t like following recipes and prefer to wing it. I find winging it to be a bit stressful at the end of a long day, so I typically go with recipes. I discovered that cookinglight.com and vegetariantimes.com both list the nutritional information for their recipes, so they were great resources when I was trying to hit specific nutritional goals. I have a collection of cookbooks full of tried-and-true recipes that I always go back to. When I have a certain ingredient in mind, or an idea for a dish, I love going to Foodgawker.com to search through the food blogger photo gallery. 4. Ok, so now you’ve figured out how many nights you need meals for, how often you will be cooking, how many meals you need, and what those meals will be. Now it’s time to make your grocery list. I use the ShopShop app on my IPhone, but any list will do. When I’m REALLY on top of things, I sort my list based on the layout of the store. This happens approximately once a year. 5. Go grocery shopping. Your store should probably be in line with your priorities if possible. We go to the budget-friendly store nearby, but we meet our healthy-living goals by being part of a CSA, and occasionally supplementing with items from Whole Foods or Trader Joe’s. 6. Start cooking! If you’re going to make meals for multiple nights, make sure that you have adequate storage containers, and room in the fridge for your leftovers. And one final tip: It gets easier. I promise. It may feel overwhelming at first if you aren’t used to it, but over time, you will find resources and methods that work for you and your lifestyle. Depression. Ihazit. I started seeing a therapist about four years ago. I entered the therapeutic process viewing myself as Little Miss Self-Aware. I had a psychology degree, but I didn’t know what to do with it. I was the queen of self-analysis, second only to my sister. I knew how the DSM IV defined depression. Imagine my surprise when my therapist told me that I was depressed, and that I likely had been for many years. Up until then, I thought that I was lazy and unmotivated. I thought that I was incapable of working hard. Not only was I suffering from depression, but I was also beating myself for it, as if I was completely to blame for my chemical imbalances. As if the shame and guilt would make it go away. I started therapy because I was unhappy (well, duh). Mostly, I was unhappy about my lack of career path. I was in a job that I hated. I knew that everything about it was wrong for me, but I lacked the confidence to face potential failure by trying something new. I have cried almost every Sunday afternoon since started the job 6 years ago. The situation has taken a serious toll on my mental health. I knew that it was unhealthy for me, but I didn’t know how to get out, and then I felt stuck in it, which further contributed to my depression. Now, I haven’t quite sorted out the job vs. depression thing. It’s a bit of a chicken and egg situation. Depression is super annoying. If you’ve never experienced it, consider yourself fortunate. I think that most people have felt grief at some point in their lives. Depression feels kind of like grief, but about regular, every day things. Depression isn’t just unhappiness. It’s pain. If my husband weren’t an atheist, I would call him a saint for sitting by my side during all those tearful episodes, wanting nothing more than to take my pain away. This isn’t to say that I haven’t experienced happiness in my 31 years. In fact, the purpose of this blog was to acknowledge the things in life that make me happy. But the “I love myself and I love my life” kind of happiness has always been elusive for me. It’s a work in progress. That being said, I am about to embark on major life transition. I am quitting my job at the end of this month to continue my quest for happiness. Since starting therapy 4 years ago, I have explored several career paths without ever fully putting myself out there. Talking to people was too scary. Trying to get a new job was too scary. My self-esteem was just too fragile. However, I developed an interest in nutrition, and I’ve been in school part-time to eventually become a registered dietitian. It turns out that I’m actually capable of working really, really hard. I can think of nothing more satisfying than to work one-on-one with people to empower them to make the changes that they need to be healthy and happy. Some people are ok with a job being just a job, and not relating to it on a personal level. I’m not one of those people. However, I feel hypocritical attempting to help others when I haven’t figured out how to help myself. I am dedicating the next year of my life to becoming a happier person. I have no idea what that’s going to look like. I have spent my entire life planning everything out to try to avoid failure, and for once, I don’t really have a plan, and I’m kind of ok with it. Once in awhile, my anxiety (oh, I have that too) kicks in, and I have a momentary freakout, but for the most part, I am excited about whatever is in store for me. I no longer feel paralyzed by fear. I’m optimistic that I will come out of this as a better wife, friend, sister, daughter, and eventually, a professional. My favorite way to plan a meal is to start with an ingredient that excites me, and then build around it. I was browsing the cheese section at the grocery store last week when I came across some Maplebrook Farm Handmade Smoked Mozzarella. Despite living in MA now, I tend to be pretty loyal to VT food producers, and on top of that, I’m a sucker for smoked cheeses, but they don’t usually fit into my budget. Well, imagine my excitement when I saw that this VT product was labeled “Manger’s Special,” and was only about $2.50. I was a goner. 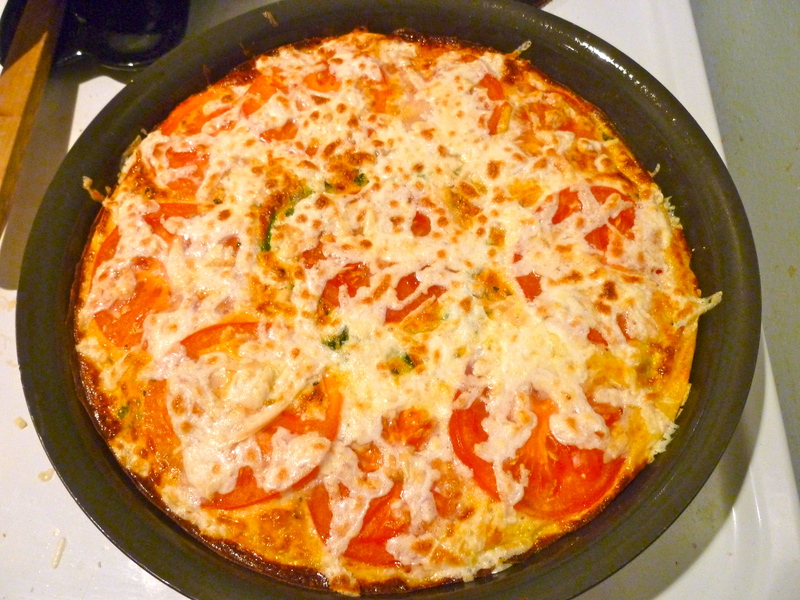 I settled on a frittata primarily for nutrition reasons, and secondarily for deliciousness reasons. I try to make protein a priority in every meal, and the thought of smoked cheese and tofu just wasn’t working for me. I thought that the sweetness of caramelized onions and the acidity of fresh tomatoes would work well with the smoky, saltiness of the cheese. I hate when food doesn’t have enough color, so at the last minute, I added some baby spinach. Oh, and the nice thing about smoked cheese is that it packs a big flavor punch, so you can still get the flavor without using a lot of it. I was figuring it out as I went, so I probably used more cheese than I really needed to. Ok, ok, here’s the recipe. Slice the onion lengthwise into thin slices. Heat 1 tsp olive oil in a frying pan over medium heat. Add the onions and cook until they are soft and darker in color. If they start to burn, lower the heat and continue cooking. I think mine took about 25 minutes. It’s helpful to Google how to caramelize onions if you’re not familiar with the process. 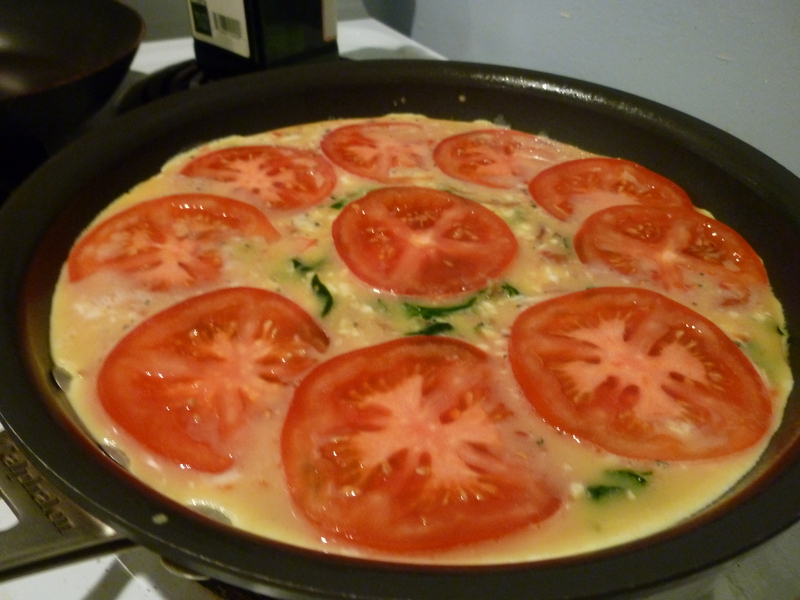 Once the onions are done, add the diced tomato and baby spinach to the pan until spinach is wilted. Remove from heat and set aside. In a medium bowl, combine the eggs, egg whites, milk, herbs, salt and pepper, and about 3/4 cup of shredded cheese. 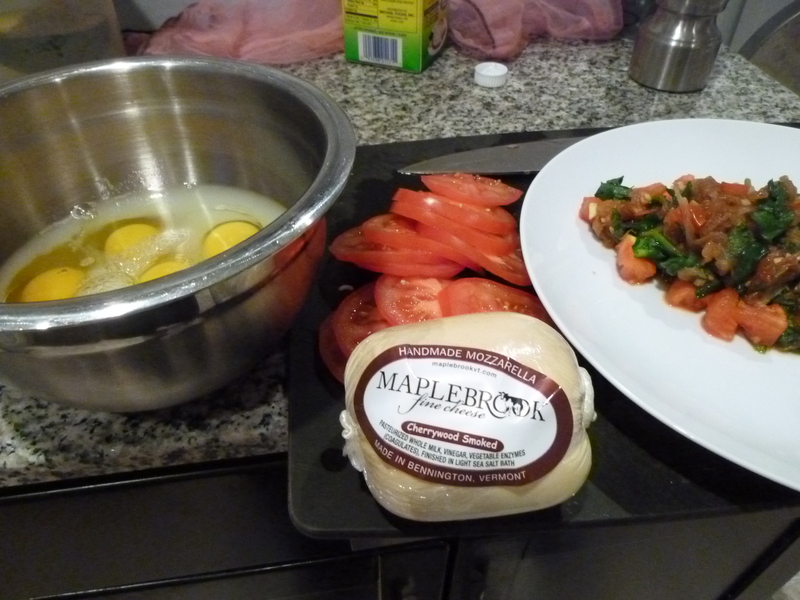 Add the onion/tomato/spinach mixture to the eggs. Oil (or spray) an oven-safe frying pan, and heat over medium heat until the pan is hot. I like to use a 10-inch pan for frittatas. Once the pan is hot, add in the egg/vegetable mixture. Layer the tomato slices on top. I did this purely because I thought it would look pretty. It did until I covered the slices with cheese. Oh well. Cook until it has set, and only the top appears uncooked. Sprinkle the remaining 1/4 cup of cheese on top, and place under the broiler until the top has set, and the cheese is bubbly. I should add that sometimes tomatoes cause there to be little pockets of uncooked egg, which is what happened in this instance. Once it was done under the broiler, I put the frittata in the oven at 350 for about 15 minutes, and that solved the problem. I’m sure that there are better frittata techniques out there. I was just too far into it to change what I was doing. I’m not going to lie. This recipe took awhile, between slicing and dicing everything, caramelizing the onions, layering ingredients, and waiting for everything to cook, but the combination of flavors made it so worth it. Enjoy! You guys, I’m just yolking. Hahaha. The title of this post makes me laugh. So dorky, I know, but I just finished my microbiology final exam, and I am in rare form. Microbiology is a really interesting subject, but my professor made it a terrible class. I’m pretty excited that it’s over. I decided to celebrate with a glass of Sauvignon Blanc and a dinner of healthy leftovers. My dinner was so delicious that I decided to share the recipe with you. Full disclaimer: My husband actually made it, but I modified it, so it still counts. Really. Rinse the black-eyed peas. Place them in a soup pot with garlic cloves and enough water to cover. Bring to a boil, then lower the heat, cover, and cook for 45 minutes, until tender, adding water occasionally as needed. When the peas are tender, if most of the water has not been absorbed, lightly drain them. Cover and set aside. Rinse the greens and set aside. In a large skillet, heat the oil and saute the minced garlic and thyme for 1 minute, stirring constantly. Add the damp green and continue to stir until they are wilted but still bright green. Stir the greens into the beans and mix. Add salt and pepper to taste. The instructions above are basically copied from the original recipe. I decided that it was a little boring, which is where the yolk part of this post comes in. I eat a lot of eggs. Until a couple of years ago, I was anti-yolk. It grossed me out. Well, now I can’t seem to get enough. 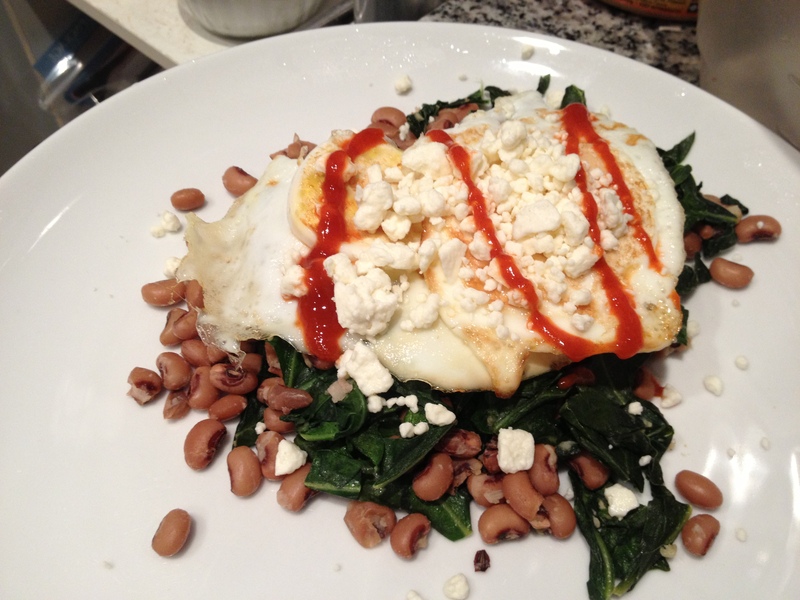 There are so many dishes that are 1000x better with eggs on top! Like the sweet potato and kale hash that we made a couple of weeks ago, but I didn’t take a picture, so I can’t remember exactly what was in it (but it was good). I also try to not eat a ton of rice unless the deliciousness of a dish is dependent on rice. So anyway, I decided to top my peas and greens with a couple of eggs-over-medium for some richness, a sprinkle of crumbled feta cheese for some saltiness, and a drizzle of Sriracha for heat and acidity. The final result was healthy and delicious. Healthylicious. I hate being a cliché. I really do, but after massive sugar consumption over the holidays, and realizing that I no longer fit into clothes that I bought only a few months ago, I had to face the scary truth that my healthy eating habits have slipped. There were tears. Lots of them. My poor husband. I joined the masses of New Year’s resolutioners with a vow to be healthier in 2013. On Christmas Day, a friend invited me to join her in a 30-day sugar detox, starting January 1st. Her plan was to simply resist eating desserts and read food labels to avoid added sugar. Of course I couldn’t make things so simple for myself. I decided that in order to increase the likelihood of success, I needed more structure. I needed a set of rules. When it comes to carby snacks, if you give me an inch, I will take a mile. I didn’t trust that I could make real changes without slipping. Instead, I got on board with the Balanced Bites 21-Day Sugar Detox when a friend introduced me to it. I’m not going to spell out all of the details, but the big idea is to eliminate all processed foods, alcohol, and anything sweet (including most fruit) for 21 days. There are 3 levels to the program, depending on where you are in your journey. There are lists of “yes,” “no,” and “limit” foods with modifications for athletes, pregnant women, and vegetarian/vegans (that’s me!). I stuck with level 1, which is the least restrictive, and unlike the other levels, I was able to eat some legumes, grains, and full-fat dairy. Yesterday was my final day of detoxing, and after finding myself overwhelmed with emotions and thoughts around the experience, I thought it would be best to get everything down in writing. Let me preface it by saying that I have been a sugar fiend my entire life. It’s not just that I love bread and cookies and chocolate. Since childhood, these foods have been my go-to coping mechanisms whenever I’ve felt anxious or unhappy. When I was “on track” with whatever healthy plan I was attempting, I felt deprived. I attempted moderation, only to find that what started out as an occasional treat quickly became a daily occurrence. I’ve been working at this for years. A few months ago, I decided to go sugar-free for a week. I lasted 4 days. I have now completed 3 full weeks without sugar, artificial sweeteners, alcohol, or flour. What?? How?? Who? Where?Huh? Yup, I’m still in disbelief. It was hard, but not as hard as I had expected. I’m a total rule-follower, so resisting the “no” foods wasn’t that difficult because I had rules to follow. The cravings were manageable, but I did get sick of relying on the same foods for 21 days. By the last week, I was desperately craving more variety. A lot of people report negative physical effects for the first few days, and then they feel great for the rest of the detox. I did not have such a positive experience. I suffered from headaches and fatigue for most of the 21 days. I continued to exercise regularly, but it took me longer to recover than it has before. I felt deep muscle fatigue for days. I suspect that some of the negative side effects were from the drastic reduction in total daily carbs, rather than from the elimination of sugar and flour. My energy seemed to even out a bit about a week ago, but my mood continued to be all over the place, and (WARNING: TMI!!) my menstrual cycle is totes wackadoodle. Yup, I said it. I warned you. I’m not about to argue that my body thrives on wine and croissants, or that this sugar/flour-free way of eating is totally wrong for me, but when it comes to long-term changes, I need to do some tweaking. Plan, prep, plan, prep. I used to be good about this, but I got lazy. This was a good reminder of how important it is if I want to be healthy. A lot of foods have natural sweetness and can be enjoyed if I’m not in the habit of bombarding my taste buds with sugar. Coconut products and almond butter are delicious. I do well with specific rules. I seem to crave variety more than most people. If I get bored with food, I am more likely to stray. It was a relief to be diet-compliant without counting calories. It’s something to strive for. Dietary fat is (maybe) not evil, and it can improve satiety, ultimately reducing cravings. There are conflicting studies and opposing views on this topic. I need to research it more before deciding what I think is best. I should get more of my carbohydrates from vegetables. I’m a vegetarian who doesn’t eat enough vegetables. Regular exercise is important to my happiness. I need to eat in a way that supports an active lifestyle, which I *think* means increasing my consumption of healthy carbs (vegetables, grains, beans, fruit, etc.). Protein. Protein haunts me in my sleep. The average American consumes much more protein than their bodies can use, but I don’t think that’s the case for this weight-lifting vegetarian. During the detox, I basically replaced carbs with fat instead of increasing protein. It’s something to work on. Compulsion is compulsion, whether it’s in the form of chocolate or raw nuts. Of the challenges that I faced, this one is the most problematic, and the most difficult to solve, but hey, at least I found a topic for therapy this week. While this was not the amazingly positive, transformative experience that some people report, I learned quite a bit about my eating patterns. Most importantly, I DID IT. I put mind over matter. Pre-detox, I beat myself up constantly for not having the will-power to resist certain foods. This little experiment proved to me that I DO have will-power. I DO have control over food. I would say that this lesson alone made it all worth it. I grew up in a suburban Vermont town on Lake Champlain. When I lived there, I couldn’t wait to leave. It felt too small. Too remote. Too culturally and ethnically homogeneous. Too boring. It was all just too familiar. How did I not see it? A few weeks ago, my husband and I went to visit his dad in Vermont. We met in high school, so his home town is my home town. We left Boston on a Friday afternoon, along with the rest of the city, and traveled alongside the countless minivans and SUVs of people starting their summer vacations further north. It was a hot and hazy drive. The road opened up and the air became cleaner as we went through New Hampshire. We crossed the border into VT and then it hit me. Oh. My. God. Vermont is BEAUTIFUL. The air was sweet with the smells of grass and trees. The mountains were majestic. I said to my husband, “Wow, the Green Mountain State is so….green!” Idiotic, I know, but somehow I had failed to notice it during the 20-ish years that I lived there. We spent that Saturday hiking Camel’s Hump, which I had attempted years ago, but was not fit enough to do it. This time, I passed the test with flying colors, and was rewarded with a stunning view. That night, we went out to dinner in downtown Burlington, where I relished in the glow of the evening sun against the red brick of the buildings. Lake Champlain sparkled in the sunlight. Sigh…it was beautiful. Why is it so easy to take for granted the beautiful things around us? Is there something about “home” that makes it that way? Do we need to make more space in our crowded minds to see it? For over 5 years, we have been making Boston our home. The back yard of our 1-bedroom apartment is actually a large rectangle of pavement, so we built raised beds on top of it and each year, we try to bring more nature into the space. Maybe the comforts of VT stayed with us more than we realized. The reality is, there are a lot of beautiful things in Boston. I ride my bike to work and go for walks during my lunch break, and in the past few months, I’ve made more of an effort to stop, clear my head, and truly appreciate the beauty around me. I love riding my bike over the Charles River on a clear, cool night, when there is little to distract from the city lights that glimmer on the water. I love walking through the nearby community gardens, where I can be amazed by the level of effort, skill, and creativity that has gone into each plot. I love when geese cross the street and stop traffic. I don’t drive in the city, so I can find this adorable. I love that sailboats glide along the river against backdrops of bridges packed with buses, cars, and trains. I love the tranquility of the Boston Public Garden. I love that nature has been nurtured in this otherwise urban environment. I am so enamored with this place that I now carry my camera with me at all times, and I am probably driving my Facebook friends crazy with all of the photos that I post. I just want people to experience the beauty that I see. I’ve always struggled to find happiness within myself. This lends itself to a certain negativity. Frankly, I’m tired of it, and I’m pretty sure that other people are too. I am finding it so valuable to stop for a moment now and then, and absorb the beauty of this life that I am living before the moment has passed. Maybe someday I will be able to see it in me. I know, I know, that’s quite an inflammatory statement, given how many people enjoy running, but it’s true. I hate it. I could be in the most beautiful place on earth, and I would still hate it. I could buy the best running shoes that money can buy, and I would still hate it. I could make it my one and only fitness goal, force myself to do it every day, and I’m pretty sure that I would still hate it. That “zone” that so many runners speak of? Yeah, I don’t think I’ve ever found it. Every once in awhile, I say to myself, “I am a fit person. I should not despise this activity that so many people benefit from. I should be able to do this.” I clip on my adorable hot pink iPod Shuffle, lace up my shoes, and head out onto the 3 mile loop that I have found. I am ready. I start out, ponytail swinging with every movement, thinking, “Hey, this isn’t so bad.” A few minutes later, my quads start burning. A little while later, my left knee shouts out, “Hey, remember me? !” Soon I feel like I am trudging through mud. I am so bored with the repetitive motion that I feel every breath, every jolt of impact on my joints, every twitch of my muscles. And then I remember…I hate running. Lesson learned: I do not have to like it just because other people do. Let’s backtrack about 20 years to the fitness challenge that was required of all grade school kids. That awful, horrible, agonizing, traumatic, #!%)! *&#$*& fitness challenge. I’m still traumatized by it as an almost-30-year-old. That 1-mile run around the track haunts me in my dreams (okay, maybe I’m a little melodramatic). I will never forget the feeling of being the only kid who couldn’t do it. It didn’t seem to matter that I passed the other tests with flying colors, because I would finish the running test so far behind everyone else, ending in tears and wanting to vomit. Feeling ashamed. I felt the same way about team sports. I don’t know why it was such a sensitive thing for me, but I would avoid them at all costs, and there were often tears involved. I got so upset during a day camp soccer game one day that my mom had to come pick me up. I would try to weasel my way out of gym class and get credit for activities that I didn’t actually do. I had a deeply ingrained sense that I deserved to feel ashamed. After college, I finally started taking better care of myself. I joined the Y and attended my first group fitness class. I was nervous to the point where I remember my hands shaking. What if I can’t do it? What if people are mean to me? What if I get in someone’s way? What if I don’t know what equipment to use? What if I make a fool of myself??????? (a.k.a, the worst thing ever). Well, it turns out that I’m pretty good at choreographed exercise. I loved the class. When we moved to new places and joined new gyms, I went through the same initial anxiety of trying a class for the first time, but I felt more confident that I could do it. Soon I was doing several different classes a week. Step aerobics, kickboxing, bootcamp, spinning, Zumba, strength classes…I LOVE group fitness, and I’m not ashamed to admit it. Lesson learned: I might make a fool of myself, or I might discovered something that I love. It’s worth finding out. However, I started to get bored. The instructor’s weren’t changing things up enough, and I was pushing myself so hard to get a good workout that I was getting injured. My husband had been biking to work in Boston for a little while, but I was terrified of riding in traffic. It was a far cry from the sidewalks and bike paths of my childhood. In 2010, I made it my long term goal to work up the courage to eventually ride into the city. Well, it turned out to not be so long term. That summer, I did it. I faced my fears. I pushed through the anxiety that had previously paralyzed me, and I did it. I started riding my bike to work, and on my fourth attempt, I fell. One of my biggest fears was realized. I was on a bumpy side street in Cambridge, and at the last minute, I saw that there was a giant hole on the far side of a street grate. I panicked and braked too hard, and went flying (or so I thought). I was shocked, shaken, and hurt. My elbow was seriously bruised, and I couldn’t fully straighten my arm without having shooting pains. I was back on my bike within a week. I learned two weeks later that I had fractured my elbow. Whoops! Lesson learned: Many things. I have a high pain tolerance. I am more mentally resilient than I ever thought. I am capable of accomplishing new things by facing my fears. And also, I like biking in the city. I like going fast when I can. I like passing people. As much as I complain about it, I like navigating through traffic. I like spending the beginning and end of my work day in the open air, moving my body. I also like that it takes me half as long to bike to work as it does to take public transportation. I biked until the end of November, 2010, when I decided it was too cold. By February, I was fed up with doing hours of cardio each week and counting WW points, and seeing no changes on the scale. I had been hearing about the New Rules of Lifting for Women program for months, but was too intimidated to try it. I finally decided that I needed to change things up, and I was able to recruit a friend to do it with me. That definitely helped with the intimidation factor, especially because the program required that we venture into “that” part of the weight room and use the equipment that “those” big, muscly men use. We met twice a week for our workouts from March until November. We were so diligent, even through the summer, when we would have preferred to be outside. We both saw great results, but more importantly, it was SO empowering. I learned my way around the weight room enough that I felt comfortable going by myself, and I loved challenging myself with each workout. I couldn’t believe the things that I was accomplishing. With the help of the New Rules of Lifting for Women program, I realized that strength is important for lifelong health, and I intend to continue lifting whenever possible. I am continuing to educate myself about fitness and nutrition, and I am now on my third weight lifting program. About 6 weeks ago, I did a pre-test for my current program, and I was able to dead lift 175lbs and squat 165lbs. Before I started lifting weights, I never would have imagined that I would be capable of such things. I am now doing workout programs that resemble how athletes train. It’s crazy. Lessons learned: I am physically and mentally stronger than I ever thought. I am much more motivated when I have structure to follow. If I want to see progress, I need to always challenge myself and try new things. I AM FIT. Last week, I bought myself some adorable bright pink sneakers. I put them on with my gym clothes and my husband said to me, “You look sporty.” What?! Me? I, the girl who couldn’t do the 1-mile running test is capable of looking sporty? I am finally starting to view myself as a fit, healthy person. Sometimes I even feel athletic. Whoa. I guess the point of all of this is to say that we all need to carve our own paths. I am not unfit or unhealthy because I choose biking and lifting and kickboxing over running. It’s hard to go against the grain when advice is being thrown at you from all directions about how to be healthy, but it’s important to find what works for YOU. Exercise does not need to be punishing. If you can find activities that you can enjoy without thinking only about your next weigh in, or how your pants are fitting, you are on the right path for long term success. A few weeks ago, I needed corn tortillas for an enchilada recipe. I could not find a single corn tortilla in the grocery store, so when I saw that masa harina was on sale, I thought, “Yay! New challenge!” It turns out that it’s pretty easy to make tortillas. I just used the instructions on the bag of masa harina. Combine the masa harina with salt and water to form a dough. Dough should be smooth and not sticky. If the dough feels dry, add water one teaspoon at a time until it reaches the right consistency. Keep dough covered with a damp cloth. Divide the dough into 16 equal portions, and roll each portion into a ball, keeping them covered when not in use. Unless you are lucky enough to have a tortilla press, you will need to use a rolling pin. Place a ball of dough between two sheets of plastic wrap or wax paper. Roll the dough out until it is approximately 5 inches in diameter (it will be very thin). Carefully place the circle of dough into a heated frying pan and cook over medium-high heat, approximately 50 seconds on each side. It should be slightly browned on each side. Keep cooked tortillas under a cloth until ready for use. I haven’t figured out how to get them perfectly round, but maybe you will have better luck.